This case about a Morris agreement on a title policy has a very complicated factual background. The court presents it at length. Our summary simplifies, though it does assume knowledge of Morris. 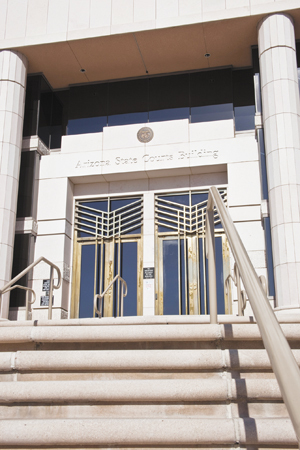 Some investors obtained from a bankrupt lender its deed of trust on a development in Tempe (Centerpoint) and then foreclosed it to take control of the development itself. They also bought some adjacent property for a parking lot. With these transactions came title policies insuring their interest in the property. So when mechanics’ liens allegedly having higher priority were asserted the investors tendered the defense of those suits to the title insurers, which accepted under reservation. Eventually the investors needed to sell the property in order to pay off additional loans they themselves had taken out on it. They couldn’t do that without clearing the liens but didn’t want to clear the liens for fear of forfeiting their claim that the insurers should do that for them. Instead they came up with a scheme that we were going to make pithy and very witty comments about until we noticed that one of the lawyers in this case brags on his web page that he was its “architect,” in light of which the better part of valor is to let you form your own opinion. The investors formed a separate entity, which they controlled. They sold the property and had part of the payment diverted to that entity, which used it to purchase the lien claims and an assignment of the lienholders’ rights against the investors. The entity then substituted itself as plaintiff in the lien claims against the investors. Finally, the investors as defendants agreed with the entity (i.e., themselves as plaintiffs) to a Morris deal on the lien claims, with a judgment three times the amount actually used to resolve the liens – which amount, if collected, the entity agreed to pay across to the investors. When the insurers challenged this the trial court decided it that it was just fine and that, assuming coverage (which had yet to be determined), the insurers would owe the entity the amount of the stipulated judgment. And by finding that nobody had done anything wrong the court foreclosed – and therefore dismissed – claims of intentional interference with contract that the insurers were making. The insurers appealed. The insurers wanted the court to hold that Morris doesn’t apply to title policies. The court says that it needn’t address that because even if Morris applied to title insurance in general it doesn’t apply here. The court reviews the background and purpose of Morris agreements and finds that this agreement “falls outside [their] permitted parameters.” The agreement was not made at arms length. The lien claimants, by assigning their rights, “effectively settled their claims unconditionally . . . leaving no risk of excess liability for the insureds.” The amount of the judgment inflated both the amount and nature of the insured’s actual liability and hence of the insurance coverage. The court therefore also reinstates the claims of intentional interference with contract and remands. This entry was posted in Court of Appeals Division One. Bookmark the permalink.